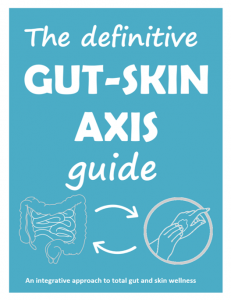 This is an exclusive preview from “The definitive gut-skin axis guide”, a 40+ page integrative, evidence-based guide to healing the root cause of gut and skin disease. If you subscribe to my email list, I’ll be sure to send you a free copy when it is released next week! While there are many nutrients that are important to our health, the following sixteen micronutrients are the most important for the gut and skin. For each nutrient, I will discuss its role in gut and skin health and provide a list of the best food and supplemental sources. Note that it is always preferred to get our nutrients from food (or sunlight) rather than from supplements. Zinc helps maintain the structure of cell membranes and proteins and has anti-inflammatory effects. Zinc activates a protein called collagenase, which allows cells to remodel collagen during wound healing.1 Zinc supplementation has been shown to reduce gut barrier permeability,2,3 and it may help leaky skin as well. The earliest sign of zinc deficiency is usually patches of dry skin. Evidence suggests that supplemental zinc may reduce acne4 – in some cases, it has even been shown to be as effective as tetracycline antibiotics.5 This may be because it helps regulate sebum production in the sebaceous glands. The best sources of dietary zinc are liver, kidney, beef, lamb, and shellfish. Plant foods like nuts and pumpkin seeds can be high in zinc, but it is less bioavailable due to high levels of phytates that bind the zinc. You can also supplement with up to 30 mg per day of zinc picolinate. Care should be taken to balance zinc and copper intake. Vitamin A modulates skin growth factors, promotes epidermal differentiation, inhibits sebaceous gland activity, suppresses androgen formation. It also inhibits enzymes that degrade collagen with aging.6 Vitamin A has also been shown to induce gut-homing regulatory T cells and promote tolerance of the gut mucosal immune system.7,8 Synthetic Vitamin A derivatives have been used for decades as an effective treatment for severe acne and psoriasis.9 Rough dry skin and keratosis pilaris, or “sandpaper” bumps on the backs of the arms, are common signs of vitamin A deficiency. Transport of Vitamin A in the blood depends on zinc, so these two nutrients may work together promote the health of the gut, skin, and immune system. The best source of bioavailable Vitamin A is liver and cod liver oil. Vitamin A can also be obtained from the precursor beta-carotene, which is found in carrots, sweet potatoes, collards, and asparagus. Note that absorption of beta-carotene is very poor unless these foods are paired with fat. Whenever possible, it’s best to get Vitamin D from sunlight. In cases where adequate sunlight cannot be obtained, I recommend supplementing with Vitamin D3/K2 until blood levels of 25’OH-D reach 35-50 ng/mL. Those with autoimmune disease or autoimmune-like skin conditions may benefit from a level closer to 50 ng/mL. Good sources of Vitamin C include bell peppers, dark leafy greens, broccoli, brussels sprouts, citrus fruits, kiwi, guava, strawberries, and certain herbs. You can also safely supplement with up to 1,200 mg of Vitamin C. I recommend one made from concentrated berries like camu-camu and acerola, as these also have the added benefit of other bioflavonoids, polyphenols, and antioxidants. Sources of selenium include brazil nuts, walnuts, red snapper, liver, herring, onion, and poultry. You can also supplement with 100 mcg of selenium in the selenomethionine form. Note that iodine and selenium should typically be supplemented together. Most Americans get their Vitamin E from industrial seed oils like soybean, canola, and corn oil, but the preferred sources of Vitamin E are almonds, eggs, walnuts, avocados, asparagus, spinach and other leafy greens, sunflower seeds, pine nuts, and olives. I do not recommend supplementing with Vitamin E, as studies have shown that long-term supplementation may increase the risk of cardiovascular disease. Silica is a lesser-known trace mineral that can have a major impact on skin health. Several enzymes required for the synthesis of collagen and formation of connective tissue depend on silica.24 Silica may, therefore, help improve the appearance of the skin and reduce signs of skin aging. Food sources of silica include leeks, apples, green beans, strawberries, cucumber, oranges, mango, celery, asparagus, fish, and seeds. You can also supplement by adding trace mineral drops to your water. Riboflavin (Vitamin B2): deficiency of riboflavin can cause lesions on the outside of the lips, corners of the mouth, dermatitis, and other inflammatory skin conditions. Vitamin B6 is involved in the conversion of the excitatory neurotransmitter glutamate to the inhibitory neurotransmitter GABA. GABA has been shown to reduce the feeling of itch.29 Vitamin B6 also acts as a cofactor for diamine oxidase, the enzyme that degrades histamine, and supports methylation. Deficiency results in scaly dermatitis. Vitamin K2 synergizes with vitamin A and vitamin D and is required for many of their functions.36 Vitamin K2 binds calcium and prevents the calcification of elastin, a protein that keeps the skin stretched tight and wrinkle-free. Good sources of Vitamin K2 include grass-fed dairy products, pastured egg yolks, liver, and fermented foods like sauerkraut. Gut bacteria can convert some K1, primarily found in leafy green vegetables, into vitamin K2. Vitamin K can also be supplemented as high-vitamin butter oil or Vitamin D3/K2. Good sources of manganese include seafood, nuts, seeds, spinach, pomegranates, and black tea. You can also supplement by adding trace mineral drops to your water. Iron is a cofactor for the enzymes prolyl hydroxylase and lysyl hydroxylase, which catalyze the formation of hydroxyproline39 and hydroxylysine, respectively. These modified amino acids are crucial for the structural stability of collagen. Severe iron deficiency leads to anemia, which can cause pale skin, fatigue, weakness, and lightheadedness. This can also influence the gut and skin since blood is preferentially shunted to the brain and heart. The heme form of iron is the most bioavailable. Heme iron is found in clams, oysters, liver, venison, mussels, and beef. Non-heme iron can be found in pumpkin seeds, hazelnuts, spinach, tomatoes, and some herbs. Iron absorption is increased by vitamin C, and reduced by egg yolks, oxalates, phytates, polyphenols, and calcium. I do not recommend supplementing with iron unless absolutely necessary since unabsorbed iron can promote the growth of gut pathogens. Good sources of magnesium include almonds, cashews, spinach, avocado, bananas, salmon, and halibut. Magnesium content is heavily dependent on soil concentration of magnesium, and most people will not be able to get enough through food alone. I highly recommend supplementing with 400 mg of magnesium glycinate daily. Potassium is an essential electrolyte in the body and the major positively charged ion in the intracellular space. Potassium, therefore, helps control the volume of cells and helps the skin stay moisturized.43 It also helps the skin produce new skin cells. Deficiency in potassium can lead to dry skin and hair loss. Many fruits and vegetables are good sources of potassium. Potassium is highest in potatoes, sweet potatoes, plantains, squash, mushrooms, tomatoes, bananas, and avocados. Some fish, such as salmon and halibut, also contain potassium. The average American consumes less than half of the estimated potassium intake of our hunter-gatherer ancestors. It is not recommended to supplement with potassium. Sulfur is an extremely important nutrient and the third most abundant mineral in the body. Animals fed a diet deficient in sulfur produce less collagen, suggesting that sulfur is required for collagen synthesis. Sulfur is also required for the crosslinking of keratin filaments in the epidermis.44 Sulfur is also required for the synthesis of the glutathione, an endogenous antioxidant important for protecting the gut, skin, and other tissues from free radical damage. Sources of sulfur include egg yolks, poultry, red meat fish, garlic, onions, asparagus, brussels sprouts, broccoli, cabbage, and kale. Fermentation may increase the bioavailability of sulfur in cruciferous vegetables. Copper activates an enzyme called lysyl oxidase, which cross-links mature collagen fibers with other supportive fibers like elastin, helping to form a scaffold that keeps skin strong.45 Copper is also important for mitochondrial health and is a cofactor for several antioxidant enzymes. Copper deficiency may exacerbate histamine intolerance,46 and can also cause hypopigmentation of the hair and skin. Food sources of copper include beef liver, oysters, crab, dark chocolate, mushrooms, almonds, cashews, and sunflower seeds. If you supplement with copper, it’s very important to balance this with zinc. The ratio of zinc to copper should be kept between 2:1 and 15:1 for optimal health. Choline is a vitamin-like nutrient that is a key component of the phospholipids that make up cell membranes. Choline is also a precursor to the neurotransmitter acetylcholine, which stimulates the production of gastric acid and is thought to be important for skin barrier integrity.47 The transport of fat and cholesterol from the liver also requires choline, so it is also important for moderating the gut-liver-skin axis. The best sources of choline are beef liver, eggs, muscle meat, and fish. Plant foods like potatoes, Shitake mushrooms, Brussels sprouts, and broccoli can also provide some choline. Choline can also be taken as a supplement in the phosphatidylcholine form. Some choline can be produced in the body from betaine, which may be more likely to be absorbed in those with gut dysbiosis or SIBO. The top food source of betaine are beets, spinach, sweet potato, and muscle meat. Those with SIBO should consider supplementing with betaine HCl. Seltzer, J. L., Jeffrey, J. J. & Eisen, A. Z. Evidence for mammalian collagenases as zinc ion metalloenzymes. Biochim. Biophys. Acta BBA – Enzymol. 485, 179–187 (1977). Sturniolo, G. C., Di Leo, V., Ferronato, A., D’Odorico, A. & D’Incà, R. Zinc Supplementation Tightens “Leaky Gut” in Crohn’s Disease. Inflamm. Bowel Dis. 7, 94–98 (2001). Finamore, A., Massimi, M., Conti Devirgiliis, L. & Mengheri, E. Zinc Deficiency Induces Membrane Barrier Damage and Increases Neutrophil Transmigration in Caco-2 Cells. J. Nutr. 138, 1664–1670 (2008). Michaëlsson, G., Juhlin, L. & Vahlquist, A. Effects of Oral Zinc and Vitamin A in Acne. Arch. Dermatol. 113, 31–36 (1977). Michaëlsson, G., Juhlin, L. & Ljunghall, K. A double‐blind study of the effect of zinc and oxytetracycline in acne vulgaris. Br. J. Dermatol. 97, 561–566 (2006). Varani, J. et al. Vitamin A Antagonizes Decreased Cell Growth and Elevated Collagen-Degrading Matrix Metalloproteinases and Stimulates Collagen Accumulation in Naturally Aged Human Skin1. J. Invest. Dermatol. 114, 480–486 (2000). Cassani, B., Villablanca, E. J., De Calisto, J., Wang, S. & Mora, J. R. Vitamin A and immune regulation: Role of retinoic acid in gut-associated dendritic cell education, immune protection and tolerance. Mol. Aspects Med. 33, 63–76 (2012). Kang, S. G., Lim, H. W., Andrisani, O. M., Broxmeyer, H. E. & Kim, C. H. Vitamin A Metabolites Induce Gut-Homing FoxP3+ Regulatory T Cells. J. Immunol. 179, 3724–3733 (2007). Mukherjee, S. et al. Retinoids in the treatment of skin aging: an overview of clinical efficacy and safety. Clin. Interv. Aging 1, 327–348 (2006). Holick, M. F., Smith, E. & Pincus, S. Skin as the Site of Vitamin D Synthesis and Target Tissue for 1,25-Dihydroxyvitamin D3: Use of Calcitriol (1,25-Dihydroxyvitamin D3) for Treatment of Psoriasis. Arch. Dermatol. 123, 1677-1683a (1987). Li, Y. C., Chen, Y. & Du, J. Critical roles of intestinal epithelial vitamin D receptor signaling in controlling gut mucosal inflammation. J. Steroid Biochem. Mol. Biol. 148, 179–183 (2015). He, L. et al. Gut Epithelial Vitamin D Receptor Regulates Microbiota-Dependent Mucosal Inflammation by Suppressing Intestinal Epithelial Cell Apoptosis. Endocrinology 159, 967–979 (2018). Cantorna, M. T. Vitamin D and its role in immunology: Multiple sclerosis, and inflammatory bowel disease. Prog. Biophys. Mol. Biol. 92, 60–64 (2006). Michaëlsson, G. & Edqvist, L. E. Erythrocyte glutathione peroxidase activity in acne vulgaris and the effect of selenium and vitamin E treatment. Acta Derm. Venereol. 64, 9–14 (1984). Pence, B. C., Delver, E. & Dunn, D. M. Effects of dietary selenium on UVB-induced skin carcinogenesis and epidermal antioxidant status. J. Invest. Dermatol. 102, 759–761 (1994). Ziegler, T. R., Evans, M. E., Fernández-Estívariz, C. & Jones, D. P. Trophic and cytoprotective nutrition for intestinal adaptation, mucosal repair, and barrier function. Annu. Rev. Nutr. 23, 229–261 (2003). Kasaikina, M. V. et al. Dietary selenium affects host selenoproteome expression by influencing the gut microbiota. FASEB J. 25, 2492–2499 (2011). Packer, L., Weber, S. U. & Thiele, J. J. Sebaceous Gland Secretion is a Major Physiologic Route of Vitamin E Delivery to Skin. J. Invest. Dermatol. 113, 1006–1010 (1999). Igarashi, A., Uzuka, M. & Nakajima, K. The effects of vitamin E deficiency on rat skin. Br. J. Dermatol. 121, 43–49 (1989). Brown, R. G., Button, G. M. & Smith, J. T. Effect of vitamin E deficiency on collagen metabolism in the rat’s skin. J. Nutr. 91, 99–106 (1967). Seaborn, C. D. & Nielsen, F. H. Silicon deprivation decreases collagen formation in wounds and bone, and ornithine transaminase enzyme activity in liver. Biol. Trace Elem. Res. 89, 251–261 (2002). Rolfe, H. M. A review of nicotinamide: treatment of skin diseases and potential side effects. J. Cosmet. Dermatol. 13, 324–328 (2014). Weimann & Hermann. Studies on Wound Healing: Effects of Calcium D-Pantothenate on the Migration, Proliferation and Protein Synthesis of Human Dermal Fibroblasts in Culture. Int. J. Vitam. Nutr. Res. 69, 113–119 (1999). Aprahamian, M., Dentinger, A., Stock-Damgé, C., Kouassi, J. C. & Grenier, J. F. Effects of supplemental pantothenic acid on wound healing: experimental study in rabbit. Am. J. Clin. Nutr. 41, 578–589 (1985). Chen, L., Wang, W., Tan, T., Han, H. & Dong, Z. GABAA Receptors in the Central Nucleus of the Amygdala Are Involved in Pain- and Itch-Related Responses. J. Pain 17, 181–189 (2016). Mock, D. M. Skin manifestations of biotin deficiency. Semin. Dermatol. 10, 296–302 (1991). Yakut, M., Üstün, Y., Kabaçam, G. & Soykan, I. Serum vitamin B12 and folate status in patients with inflammatory bowel diseases. Eur. J. Intern. Med. 21, 320–323 (2010). Wierdsma, N. J., van Bokhorst-de van der Schueren, M. A. E., Berkenpas, M., Mulder, C. J. J. & van Bodegraven, A. A. Vitamin and Mineral Deficiencies Are Highly Prevalent in Newly Diagnosed Celiac Disease Patients. Nutrients 5, 3975–3992 (2013). Degnan, P. H., Taga, M. E. & Goodman, A. L. Vitamin B12 as a Modulator of Gut Microbial Ecology. Cell Metab. 20, 769–778 (2014). Kang, D., Shi, B., Erfe, M. C., Craft, N. & Li, H. Vitamin B12 modulates the transcriptome of the skin microbiota in acne pathogenesis. Sci. Transl. Med. 7, 293ra103-293ra103 (2015). Friedman, B. J. et al. Manganese Balance and Clinical Observations in Young Men Fed a Manganese-Deficient Diet. J. Nutr. 117, 133–143 (1987). Treiber, N. et al. The role of manganese superoxide dismutase in skin aging. Dermatoendocrinol. 4, 232–235 (2012). Hutton, J. J., Tappel, A. L. & Udenfriend, S. Requirements for α-ketoglutarate, ferrous ion and ascorbate by collagen proline hydroxylase. Biochem. Biophys. Res. Commun. 24, 179–184 (1966). Tidball, C. S. Magnesium and calcium as regulators of intestinal permeability. Am. J. Physiol.-Leg. Content 206, 243–246 (1964). Winther, G. et al. Dietary magnesium deficiency alters gut microbiota and leads to depressive-like behaviour. Acta Neuropsychiatr. 27, 168–176 (2015). Denda, M., Katagiri, C., Hirao, T., Maruyama, N. & Takahashi, M. Some magnesium salts and a mixture of magnesium and calcium salts accelerate skin barrier recovery. Arch. Dermatol. Res. 291, 560–563 (1999). Nakagawa, N. et al. Relationship between NMF (lactate and potassium) content and the physical properties of the stratum corneum in healthy subjects. J. Invest. Dermatol. 122, 755–763 (2004). Brown, R. G., Button, G. M. & Smith, J. T. Changes in Collagen Metabolism Caused by Feeding Diets Low in Inorganic Sulfur. J. Nutr. 87, 228–232 (1965). Rucker, R. B. et al. Copper, lysyl oxidase, and extracellular matrix protein cross-linking. Am. J. Clin. Nutr. 67, 996S-1002S (1998). Curtis, B. J. & Radek, K. A. Cholinergic regulation of keratinocyte innate immunity and permeability barrier integrity: new perspectives in epidermal immunity and disease. J. Invest. Dermatol. 132, 28–42 (2012).